The more you pursue success, the more interesting the question of what really causes happiness becomes. Achieving success and happiness is a confusing path! Is making more money how to be happy? Is it freedom? Belonging? Should I be taking more selfies on the beach? Here are 8 tips that cut through the clutter and provide surprising perspective on how to be happy. 1 Is success tied to happiness? 2 Confused about how to be happy? You’re not alone! Is success tied to happiness? In doing research for my next book, I dug deep into how to be happy. And more specifically, are you happy because you’re successful, or successful because you’re happy? 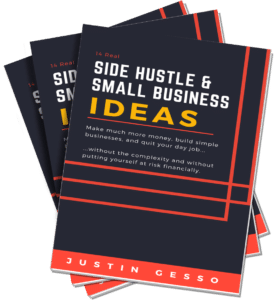 My upcoming book is about small business ideas, but I can’t speak to individual ideas without looking at the bigger picture. Generating money is great, but if you hate your business, you won’t succeed. To really be successful at anything, happiness needs to be considered. If you want the ultimate deep dive into this subject, read The Happiness Advantage by Shawn Achor. After reading it, there should be no doubt in your mind that you must first be happy to be successful. In fact, I believe this goes even further. I am now a firm believer there is a positive feedback loop associated with success and happiness. But it probably doesn’t come about the way you expect. That’s what I’ll cover in this post. 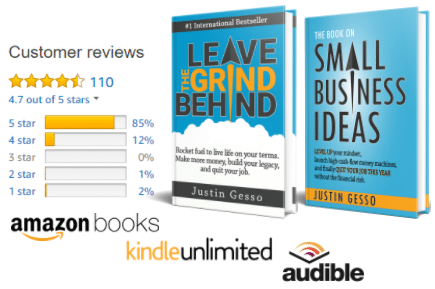 Taking a step back in time, when I wrote Leave the Grind Behind, I wrote it from the perspective of leaving a corporate job to pursue your own methods of making money. It was about living life on your terms, making more money, building your legacy, and quitting your job. Sounds pretty great, and for most people, quitting their job and making more money can bring them happiness. And it certainly was a major part of the equation for me. As I always say, the grass is indeed greener. But in that book, I started by emphasizing how critical it was to be happy and positive, yet I didn’t dive deep enough into how to be happy. Confused about how to be happy? You’re not alone! But whoa, watch out in “personal success” genre! There is no shortage of influences to help you determine what your happiness should be. The realm of personal success brings all sorts of images of young people seemingly doing nothing but posting pictures of themselves enjoying the beach, fancy cars, expensive jewelry, and countless other extravagant items. Is this happiness? Are they happy or even genuine? More importantly, is this happiness for you? All I can say is there is a confusing blur between marketing and reality. This blur is nothing new. After all, it makes sense for someone selling something to characterize it as the answer to your happiness. And of course, don’t forget the great filter of social media. People tend to post positive things from their life. So as you browse the lives of others, you’re seeing a censored portion of the whole. Over time, this leads us to believe everyone is better off than us, increases our isolation, and triggers a negative feedback loop. During my “how to be happy” research, the most unexpected source I came across was the book Tribe by Sebastian Junger. The premise is that modern civilization has given us exceptional material wealth and the ability to meet our basic needs without significant struggle. While this seems good, we are deprived of a key psychological factor for happiness: interdependence. That is, we are not struggling together as a community (tribe) to survive. And the sense of personal value that is derived from contributing to greater well being is in fact what causes happiness. This is why you see crime, mental illness, suicide, and many other “negative” factors massively reduced during collective times of struggle. For example, for a half year following 9/11, New York saw murder rates drop by 40% and suicide drop by 20%. Junger uses numerous examples, exceptional references, and data to make his points. Perhaps the most compelling are those related to war veterans–soldiers who literally fought on the front line and struggled for survival with their “tribe” every day. Counter intuitively, these soldiers reported being happy in the war zone. Upon returning home, the feelings of not belonging to a group purpose was overwhelming. Many felt lost, depressed, and alone. While they didn’t glorify war, they yearned to return to the front line. Viewed this way, the notion of PTSD is actually flipped on its head. Personally, I know several families who have unhealthy children (mental or physical). I always imagine how hard things must be in these situations, yet am also in awe of how peaceful, happy, and bonded these families seem. Having read Tribe, I now have a much different perspective as to why this might be the case. The book also provides numerous deep looks into historical and evolutionary aspects of this tribe approach to happiness. It’s absolutely fascinating and makes for a very compelling argument. How do you gain your sense of identity? As an individual or as a group? Really think about this. Consider unplugging from people not in your tribe. Who are the people with whom you go through thick and thin? Revisit your goals to ensure they include your tribe. If your success and your life plan is self-oriented, you should not expect to achieve happiness as a result. Once you’ve identified your tribe, the next step is to meaningfully contribute to that tribe. Sitting on the beach all day taking selfies may sound awesome, but it’s not the key to long-term, true happiness. Indulging…of course…has its benefits, but no matter what the media shows you, it’s not the answer. We are hard wired to work through adversity together as a group. Happiness is not about having things; it’s about being surrounded by the right people, contributing to a bigger cause, and maintaining a sense of purpose and control in your life. Another great resource is Upward Spiral by Alex Korb PhD and Daniel J Siegel PhD. While the book focuses on depression, the findings and recommendations apply much more broadly to happiness and mood in general. So take these tips and begin turning them into habits today. Being thankful for what you have is not new news in the success genre. But according to research in Upward Spiral, gratitude causes actual brain chemistry changes, increasing serotonin and dopamine, while also increasing efficiency of neurons in certain parts of your brain. “Let’s start with how you’re feeling today.” It turns out the psychiatric cliché really has something to it. Indeed, Upward Spiral shows fMRI studies that demonstrate “putting feelings into words” reduces the impact of emotions, as observed in the ventrolateral prefrontal cortex. On the opposite end of the spectrum, suppressing negative feelings was visible in the limbic system. By thinking about bad feelings and putting them into one or two words, you can reduce their impact on your mood significantly. The researchers noted this can also be achieved through proper meditation. If you’ve been chewing on a thought or an issue for days on end, make a decision and move on. According to Upward Spiral, this positively engages your prefrontal cortex, reduces anxiety and worry, reduces impulsive tendencies, and calms the limbic system. The book also notes that these positive effects are only realized when people make a choice. If they are forced to do something (like exercise vs not exercising), the benefit vanishes. I love the sayings and products over at StartUpVitamins and think their “Done Better Than Perfect” one is perfectly suited for making decisions, which is why I have it stuck on my computer as a reminder. Alright, I think we’re looping back to the idea of being part of a tribe. You need people to be happy! More specifically, you need people who are close enough to you that you can touch them regularly without getting in trouble. The route to happiness is not defined properly by most social media or marketing campaigns, so tread with caution! But the good news is there are very simple approaches and habits you can put in place starting today in order to begin actually feeling happy. And the even better news is happiness leads to success, success gives you back some happiness, and so goes the upward spiral and positive feedback loop. Let me know what you’re doing to be happy in the comments below. THIS was an AMAZING article! Thank you!! Awesome, glad you enjoyed it and thanks for the comment! Some interesting books you have uncovered. I particularly like the concept of an upward spiral when typically we focus on stopping the downward spiral. Absolutely–yeah, the upward spiral (positive feedback loop) is a great place to be. Thanks for the comment Stephen.